At the launch of Methodist Women in Britain (MWiB) in July 2011, the movement embarked upon a five year programme of solidarity with Dalit people; seeking to raise awareness of the vast scale of caste discrimination and oppression from which millions of women, men and children continue to suffer, not just in India, but here in the UK too. We began from a position of almost total ignorance of this issue; the more we have learned over the years, the more we have become committed to doing whatever we can to stimulate interest, prayer and action. The Hindu caste system which believes social status is linked to the actions – good or bad – of a previous existence can result in a contemptuous regard for the poor. Those formerly known as ‘untouchables’ have given themselves the name Dalit, a Sanskrit word meaning crushed, broken. The striking painting, ‘The Dalit Madonna’ by Jyoti Sahi was already well known in the Methodist Church, and we were delighted to be given permission by the artist himself as well as by the Methodist Church Collection of Modern Christian Art to use the image in our work. 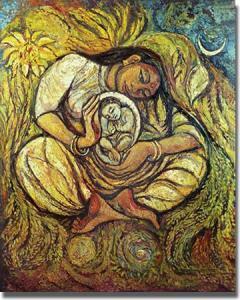 The resource pack produced by MWiB in April 2013 includes a meditation on the painting by Rev Nicola Vidamour in which she writes, ‘for many Indians ‘Dalit Madonna’ would be a contradiction in terms. How could God choose someone so lowly to be the mother of Christ? In February 2013, Linda Crossley, as incoming President of MWiB, spent three weeks as the guest of the Church of North India (CNI). Linda’s visit enabled MWiB to experience and understand more of CNI’s work with Dalits, to learn about community hostels that give Dalit children access to education and to discover the CNI’s priorities in their women’s work. As a result MWiB has entered into a formal partnership with CNI and has pledged to raise £50,000 by 2016 to support their work with girls’ education and women’s self-help groups in the poorest of dioceses.